Did you know that musculoskeletal disorders, such as carpal tunnel syndrome and tendonitis account for one-third of all work related injuries? Listen to this story and discover how you can ensure your workers are safe. We recently worked with a medical practice to replace some older ergonomic chairs due to employee back issues. Upon further investigation, the new chairs were a great help, but the bigger issue was the placement of their keyboards. They took this quiz and determined they needed adjustable keyboard trays with a mouse and gel wrist support, mounted under their desks. The result was a great ergonomic set up (provided by Consolidated Office Systems) and best of all…some happy and comfortable workers. Are your shoulders and upper arms relaxed and roughly perpendicular to the floor (not stretched forward or elevated)? Are your arms and elbows held close to your body (not extended forward)? Is your keyboard positioned at the same level as the top of your elbow? When using your keyboard, are your forearms, wrists and hands held straight and parallel to the floor (not pointing up or down)? Are your keyboard and/or mouse positioned within comfortable distance of each other? Is your mouse easy to activate and correctly sized for your hand? Is your workspace free of sharp and square edges that might interfere with your comfort? Does your chair have arm rest to help maintain proper posture without adding strain to your neck and shoulders? 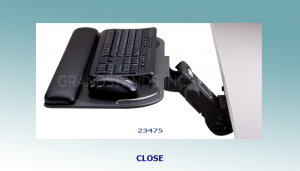 Use an adjustable keyboard tray or keyboard drawer to ensure proper posture while typing. Adjust the height and tilt until your wrists and forearms form a straight line while typing. Look for a stable keyboard tray or drawer that is large enough to hold your keyboard and your mouse. Position your mouse so it can be operated without extensive reaching. Select a mouse that comes in multiple sizes to ensure proper fit. Select a chair with arm rests to promote good posture and relieve stress. Make sure that the arms rests support both arms without restricting movement. Use a gel filled wrist rest to support your wrists and cushion them from sharp and square edges. 1. Conventional wisdom for monitor distance is that it should be 18 – 24 inches away. This is wrong. The best distance is “as far away as possible while still being able to read it clearly.” Longer distances relax the eyes. 2. Conventional wisdom for keyboard distance is that it should be be approximately at the front of the work surface. This is limiting. There’s nothing wrong with pushing the keyboard back farther if the forearms are supported, provided the wrist is kept straight and the elbows aren’t resting on anything hard or sharp. The work surface should be higher than elbow height. 3. Conventional practice for placement of the mouse is to push it away. Closer is usually better – next to the keyboard is the goal. 4. Conventional wisdom regarding a chair is that the chair should be at a height that allows the feet to reach the floor when the legs are 90 degrees (at the knee). 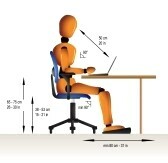 The 90 degree knee posture is not correct ergonomics although it is not a harmful position. The legs should move often, not stay fixed in the 90 degree position. The chair should, if possible, be low enough for the feet to rest on the floor even when extended. 5. Conventioanl wisdom for keyboard height is that is should be at elbow height. This is wrong, or at least too narrow. Variation for elbow height is fine, especially in the lower-than-elbow direction. 6. Conventional wisdom for monitor height is that the top of the screen should be about at eye height. This is fine for some people,, wrong for many. The current recommendation is that eye height is the highest a monitor should be, not the best height. Many people find a low monitor to be more comfortable for the eyes and neck. 7. Conventional wisdom for wrist rests is that they can do no wrong and should always be used. This is wrong. They may be able to cause harm if they’re too thick, too thin, too hard, or have sharp edges. They also can cause harm if ythey’re constantly used – they probably should be used just during pauses. The carp tunnel is under the wrist/palm and should not be subjected to much extra pressure. Put these ideas into practice and feel more comfortable during those long days at the computer.